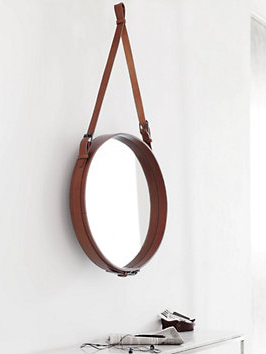 Designed in 1950, the Adnet Mirror by Jacques Adnet exemplifies mid-century French modernism. One of the first of its kind, this piece combines the mirror and a durable leather strap inspired by Adnet's work for Hermes at the time. Reissued in 2011 by Gobi it is now made in Denmark and just recently made available at Design Within Reach.